Imagine yourself in a cosy cove in your homestay over a lazy weekend. Think local food, some peace and solitude with loved ones as you decide to slip into a gorgeous pool, or head over to the jacuzzi that can do nothing else but help you relax. 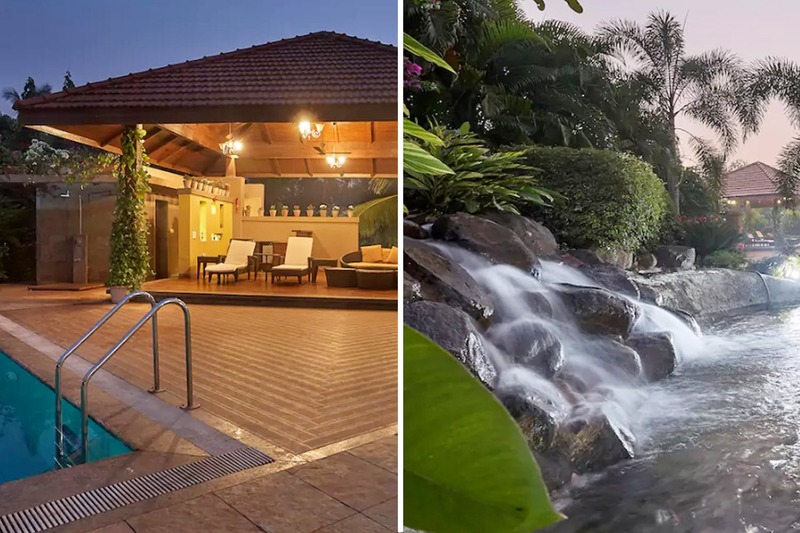 Well, you can actually plan that weekend out soon, as Alibaug, which is just a three-hour drive from Mumbai, has a gorgeous property that you can just unwind in. Moksh, a luxury villa close to Mandwa, is a 4BHK wonder that even provides speedboat services (except the monsoons) on request at an additional cost. The villa has four bedrooms, a private pool, a steam room an outdoor bar that has comfy recliners, a huge lawn to explore and even an artificial waterfall if things weren’t posh enough. The interiors are gorgeously decked up, with all the modern amenities that one can think of. There is a fully-functional kitchen, but if you want, a cook can also prepare all the meals at an extra cost. There is a gazebo by the pool with pool loungers and even a TV, in case you’re in the mood for it. The villa also has an outdoor seating arrangement that is available for up to 30 people. For those of you who love all things outdoors, you can enjoy games like cricket, badminton, football and even basketball. In case you’re driving down to the property, driver accommodation is also available at an additional charge. And yes, something as spectacular as a speedboat service is also provided, in case you need it. Whether you want to spend time just lounging outside or have a memorable stay inside, you are sure to have a great time. Apart from this, it’s just a great location to hang out with family or friends and wash all your troubles away. Have fun!